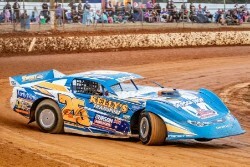 The Brims Concrete Super Sedan Series supported by the AFCO Shock Doctor moves back to the Castrol Edge Lismore Speedway this Saturday night with an excellent field entered for the 50 Lap Main event. With eyes firmly set on the Victorian Super Sedan Title at Moama, the home of the National Title in a fortnights time, eyes will also be set of Lismore, with the Queensland contingent set to have their last hit out before the trip South to contest the National Title. Darren Kane has been in ominous form lately and totally dominated last Sunday in a reduced field after rain postponed Saturday nights event. Kane lowered the track record in a heat race before driving away from the field in the main event, but there are no high banks at the Lismore Showgrounds, which in the past has suited Matty Pascoe. Pascoe finished on the podium last Sunday, and lowered the track record set by Kane, showing he too is on the pace leading into Saturday nights epic 50 lap main event and the National Title just around the corner. Ed Doherty and Bob McCosker had their best nights of the season last Sunday and are both entered for the Lismore event, as is Sean Black, Wayne Randall and Tania Smith who have all been consistent throughout the series. The Super Sedan Golden Jubilee 50 lap event will have three heats per driver, the top eight draw and then the main event, with racing scheduled to commence at 5.00pm EDST.